1. Fishing. Just craft a fishing pole and find a pool of water to cast your line. As with the meats you should be able to cook the fish. 2. Mushroom stew. Seen all those brown and red mushrooms everywhere? Collect them. Craft some bowls with a little bit of wood and put them in your crafting table with a red and brown mushroom. They don't restore much but they are plentiful. Unlike Don't Starve food in this game will never go bad, though you can certainly get sick by eating uncooked food or rotten flesh from zombies. For Phil's 2018 Indie Marathon, I assume is not going to play for long and only gonna play for 1-2 hours and will be playing single player, especially since he's playing on console. I have some idea's on what to do and I'm sure the stream chat would already be telling Phil what to do. First task: Survive the night. Gather material and find shelter before night fall. (12 hours in the game lasts 7 minutes. So 7 minutes of day and 7 minutes of night.) mine during night until day break and stay and explore, or take a few supplies and walk in any direction to find a new shelter. Find coal and make torches. You can mine for it, or use wood to make charcoal, you can also burn tools, or most wood items for fuel. Find food. Kill animals (kill sheep if possible for wool), or harvest and grow seeds for wheat, or find a village and raid crops/chests. Start mining. Inside shelter/structure dig down in a diagonal staircase manner. Try to find more coal if needed and find iron. While digging deeper, aside from hostile mob sounds, wind/creepy ambient sounds indicate a cave is nearby. When finding a cave system, light up with torches quickly, watch for pitfalls and overhangs that mobs can drop from. 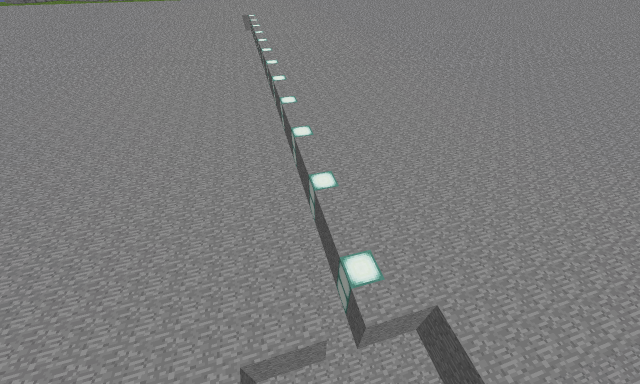 Block off unlit paths you don't want to tackle. Try not to engage hostile mobs, or explore too deeply in caves systems, or ravines without armor. 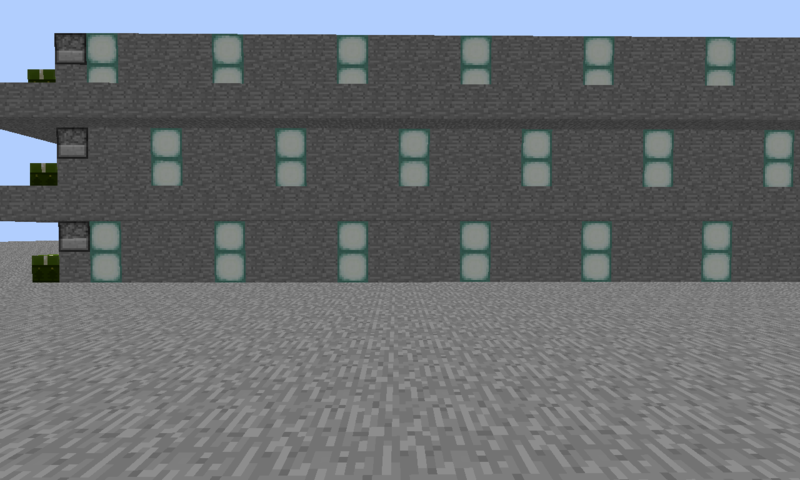 If iron ore is found, smelt at least one iron ore block to make a shield for protection. Find more iron to make full iron gear of armor, sword and tools. If there enough time to do more, find an objective to do. When exploring the surface, bodies of water one of the easiest ways deal with hostile mobs, with or without weapons. Zombies, Spiders. Creepers are best in the water and they will slow down to a crawl and can't maneuver well. While you will be much faster and allows you to get up close. Creepers will not break blocks when they explode in water, even in water that is only 1 block deep. They still will give you and other mobs splash damage when they explode. So you don't want to be close. If you happen to be close to a Creeper with a shield in water, you can use that to block some of the explosion damage and survive, especially with armor. Use a Creeper in water to gather more mobs around you and use the explosion while blocking to kill not only the Creeper, but kill, or cause a lot of damage to the other mobs. Do not be in water where a skeleton, or a Witch can hit you, being in water with a Skeleton is a bad combination. As long as there is water you can jump to, even if the water is only 1 block deep, you can jump in the water at any height, even all the way up to the build limit and take no fall damage. You can use that to get around quickly, or get away from a hostile mob. Hostile mobs will drop down a few blocks to chase you, but they will not drop down if the fall might cause them too much damage. Always keep a water bucket on you. Use that to put yourself out, or you catch fire, like if you touch lava on accident. You can use the bucket to pour over pools of lava and walk safely across, You can also use the water as a ladder. pour over the side of a long drop and fall in to descend slowly. Grab the water source block with the bucket as you fall and you can collect the water to use again and you will still descend safely. The same works in reverse. You can pour water a few blocks above you to get out of a pit. If you're fast, you can collect the water while swimming up and pour again a few blocks up and keep climbing if you're at the bottom of a long cliff. Besides water, one quick way to go straight down if you're digging, is to look straight down and have your feet between two blocks. Look for a thin black line around the border of every block, stand in the edge of two blocks and dig down, alternating between breaking the two blocks. You'll ladder down safely and if you break through to a cave, or lava below your feet, you can stop and you won't fall straight through. If you do manage to get to the Nether, be well equipped with arrows, or at least snow balls and armor. Bring cobble, Ghasts cannot blow up cobble. Not only is the terrain of the Nether already treacherous, if you're mining through Nether Rack, be careful not to dig too fast. There are random pockets of lava hiding in Nether Rack and lava flows much faster in the Nether. If digging a staircase up, dig a staircase 2 blocks wide and stay on one side, so if you do accidentally hit a pocket of lava, immediately step to the opposite side and let the lava pour down. The lava will not hit you. Deserts, with a lot of viability over the flat-ish terrain, are one of the best biomes to spot things at a distance. Not just mobs, but structures, like Desert Temples and villages. Make a 1x1 pillar with blocks to get up high, or climb up a high point and look for Temples. 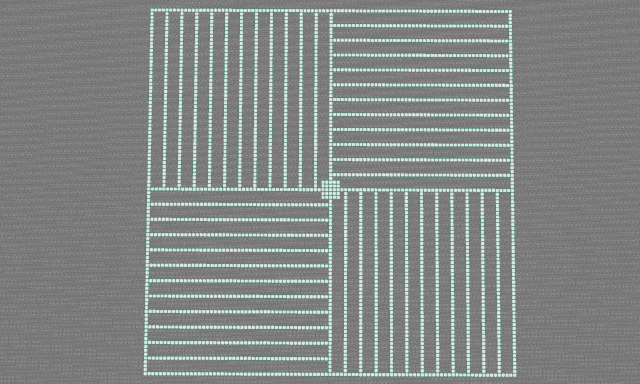 Also, look for oodly large square openings in the sand. 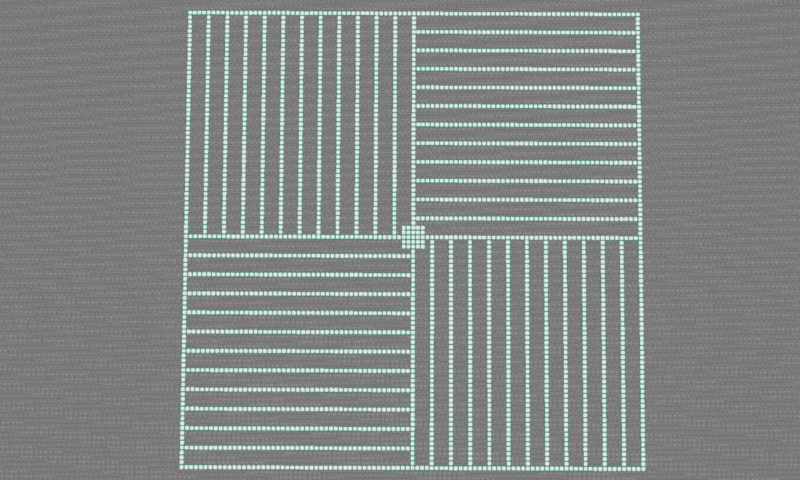 If you see a uniform 5x5, or larger square pit in the sand, it's probably a Dungeon Spawner, that would have treasure chests with loot. Another way to find Dungeon Spawners is to listen closely. If you're on the surface, or underground and you hear excessive groans/mob noises of only one type of mob, follow that noise. It's probably a spawner. In the options menu, turn on captions, you will see captions of all sounds around you, even sounds that are too far to hear. This can be helpful to know and be alerted when there is a hazard near by, like lava, or a hostile mob. Alternatively, you can use it to find something helpful, like it will show you if Villagers are near, even passive mobs for food. In the options menu, you can tweek the sounds so noises that are not too important like passive mobs, block breaks and music can be turned down and sounds from hostile mobs can be turned up to max, so some of the quieter hostile mobs, like Creepers, you can hear their steps before they surprise you. --Phil, if you fall into a pit you dont need to dig your way out, you can just jump and place blocks under you, you'll get out of pits a lot faster. --Also try to keep your hunger at 100% fed because if you get injured and lose hearts your life wont regenerate unless your hunger bar is full. --When digging out blocks never mine the blocks directly above your head, you can easily be killed by falling gravel and/or sand. Now that you got past surviving your fist night and build a shelter and did pretty good. I have some general ideas on what to do next, this should occupy you for a couple streams at least. Gather more wood and craft 2, to 3 double chests inside your base and craft a few trap doors. Use the chests to sort surplus supplies, use the trap doors to cover the top of the steps, if you don't want to keep falling in. 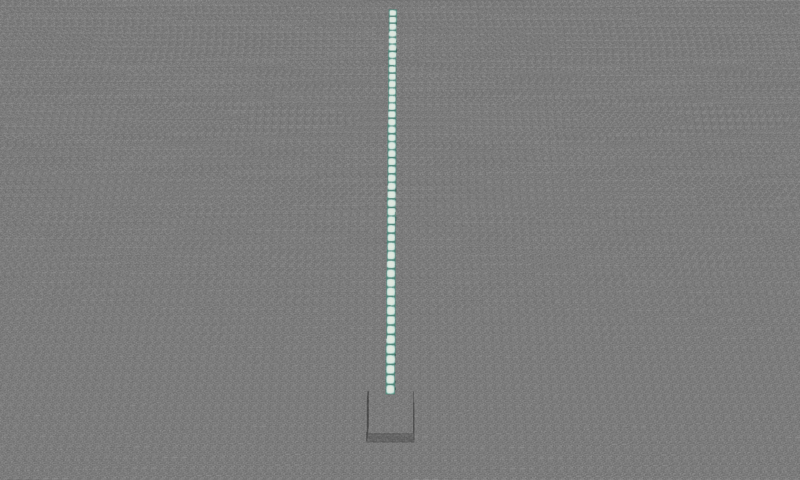 Alternatively, you can also build any barrier around the shaft to also keep from falling in. Gather more cobble and craft more stairs, 2-3 stacks (a stack is 64 items of one thing). Increase the height of the stair well. I would suggest two extra blocks of clearance. Use the cobble you gathered to craft more stairs, 2-3 stacks (a stack is 64 items of one thing.) and use the stairs to lay down in the stair well. Using stairs uses much less energy and much faster than jumping up them and will not induce hunger so quickly. Work on getting full iron gear (armor, sword and tools). I would worry about getting diamond just yet. 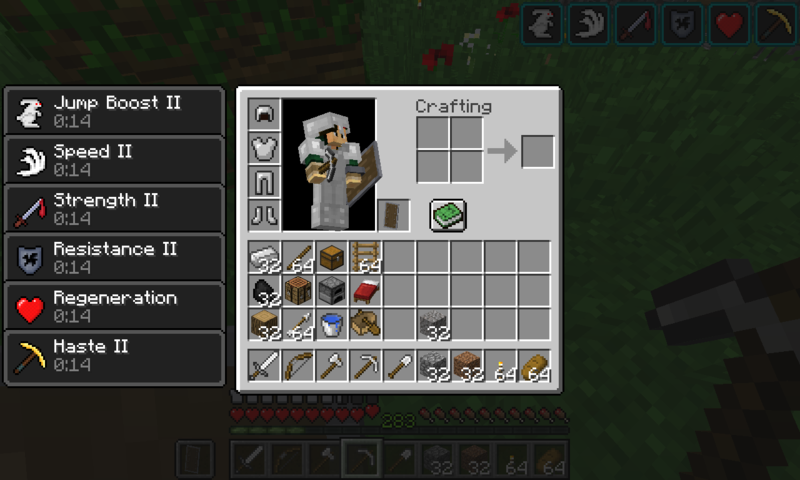 If you do find diamond, you'll need 5 at the beginning to craft one diamond pickaxe to mind obsidian witch you will need to craft an Enchanting Table, with the last two diamonds. You will also need to find Lapis. Use the Enchanting Table with the Lapis to get better armor protection and increase the damage of your sword. Second stream, you got a lot done. Before going too far from your house, I would again, make a stable source of food, amass some materials, like wood and build more chests for more storage and sort out your inventory. At 4 double chests, but I would go for 6 double chests. I would still try to make improvements on the stair well and increase the height before placing stair blocks. The reason I keep mentioning the stair blocks is that actions like sprinting and jumping make you lose hunger faster and stairs uses very little energy and is faster to move over. I would go down to mine some more. Getting a good amount of Iron and coal. Always keep plenty of torches and when you have some iron, enough to keep a bucket on you, always carry a bucket of water with you when mining, be ready to use it in case you come in contact with lava. Beside iron armor and an iron sword, when you can get iron, one of the first things you should make and keep equipped as much as possible is a shield. The Shield might become slightly cumbersome when trying to place blocks, but the shield (when blocking) can keep you from being overwhelmed by hostile mobs and get out in a bad situation. Even after you have full iron armor, an iron sword and iron tools, you should still get more iron and have a good amount of coal as well. Don't keep too much valuables in your inventory, drop off some of the valuables in a temporary chest while mining, every so often. When dont collecting a lot of ores/treasures, transport your haul to the surface, but if you die with valuables on you, you might lose all of your inventory if you can't get to it after you respawn. So try not to engage mobs if possible. When you have enough materials, then you can prepare to explore away from your house. When I go exploring, I go prepared and does make a few things easier. These are essentials I keep on me at all times if I can and while I'm on the move. I included a screen shot if what it looks like. For some blocks I have half a stack, so when you find and collect more, it doesn't fill up your inventory too fast. This inventory makes room a little tight. You might have to manage inventory frequently, to remove junk, or off load valuables. The bed is there for when you feel you are far enough where you don't want to have to travel all the way back to where you location is, in case you die. Since you do not have an easy way to find your way back home, either make and carry a map, or leave markers, like blocks you stack on the ground and leave torches on top. Losing your location to your home is a real possibility, so make a plan before you go on how you will find your way back. On short distances, and especially on long ones. 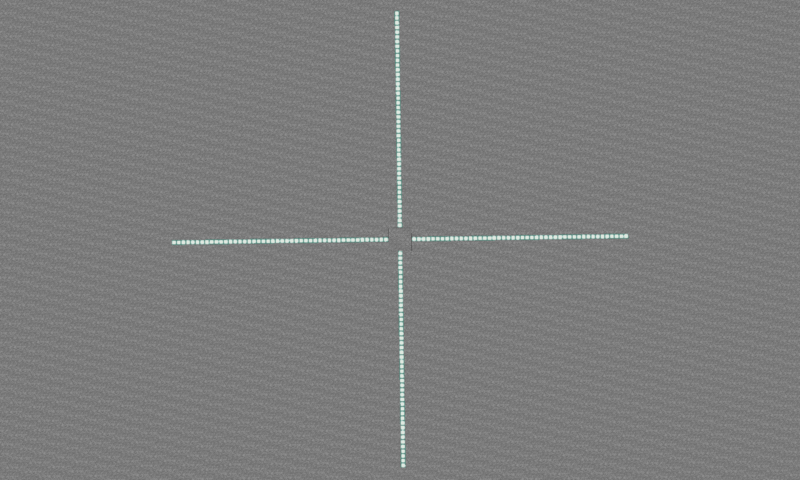 One tool you can make, since you built your home around where you originally spawned, is to craft a compass, it will always point to your original spawn, even if you move your bed and sleep in it some where far from your home. That way, no matter how far you travel, you'll find your way back. As long as you know where your home is, using another bed to reset your spawn should be fine. Useful when you traveled very far, or stopped to mine and will be there for a while. If you place a new bed at your new location and sleep in it, you will spawn there. That way you can get back to where you died and possibly collect all the items you dropped if you get there quickly and if wasn't destroyed in lava, or blown up by a Creeper. You do not have to break and take your original bed. You can just craft more beds and place as many of them down as you want, it's the last bed that you slept in is that bed you will respawn in. When you place a bed, be sure the ceiling is 3 blocks high and it is best if the sides and foot of the bed is not obstructed, also have the area around the bed well lit. If there are dark areas too close to the bed, a monster will wake you and attack you. Ah! One last tip. This might sound pretty random, but when it does come time that you go out and explore, you might come across an Enderman, the tall, slender, dark passive mobs. 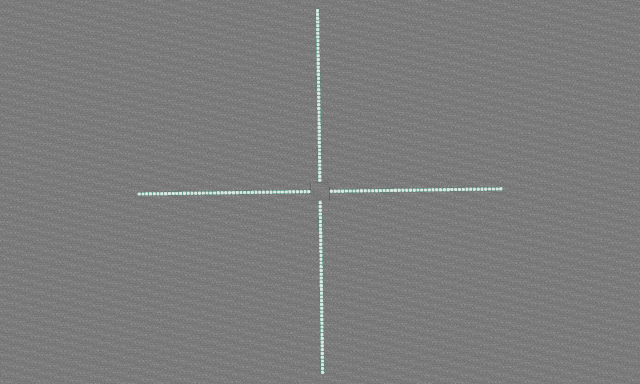 You might remember them, but do not look at them in the eye (hover the cross hairs over their head. Look down instead. They can do a lot of damage in a short time. Seems like you learned some basics. I think you can choose your own play style at this point. There's still a lot to learn. I would suggest to check out any of these guy's channels, they are chuck full of great Minecraft tutorials and many people learned how to play Minecraft through them. Grian, he does builds with a keen eye on design that is also functional, this is one video of a playlist of 34 videos. Paulsoresjr does survival, I suggest his Survive & Thrive series from 2011. His guide is nothing short of legendary. Mumbo does Redstone, he's pretty much a master at it. This is just one of many videos. There is one last thing. There is updates and to stay up to date on what is coming to Minecraft, one favorite person of mine that I like to watch is ibxtoycat. This is just one playlist of his talking about the upcoming 1.14 update. A massive update that will add a lot to the game. There was also the aquatic update that happened a while back that I think that you didn't know about. Which he has videos on that too. One thing about ibxtoycat, is he is a fast talker, to it can be hard to understand everything. Minecraft is about doing anything you want and playing anyway you want. Solo, or with others. You can learn to be an expert at something; survival, building, farming, fighting PvE/PvP, redstone contraptions, enchanting, mining. Or just something simple like learning at your own pace, as slow, or fast as you want. Exploring near, or far and experimenting with things you come across, expanding and slowly improving your base. There so many guides out there if you having trouble figuring out what to do. Anything you can think of that would sound cool, or weird to do and do it in the game. Play to survive, or build a massive structure anywhere, or shape the entire world into something you would want it to look like. You can even make your own mini-games/puzzles in Mincraft. My experience now, is making a mega structure using powerful plugins on my server that is a perpetual wip and joining a very select few servers to play survival with people I like and try different variations of builds in a style I like. I normally play solo on servers and don't participate in mini games much, or fight other players. It may sound boring, but there is one person I can think of that streams weekly in Minecraft and interacts with people on the stream and his commentary is almost like a pod cast type of stream and all he does is walk in one direction in Minecraft and that's pretty much all he does in the game, but people love it. Not only that, but he still does it, even after doing it for years. So Minecraft can also provide itself to be a good platform for streaming about as laid back as it can get, kinda like what you've been doing. So, not knowing what to do next isn't really a bad thing, it's still fun to watch and relaxing. 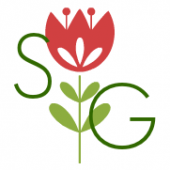 Gather every flower and make a flower bed, or garden. Make every craftable food item. Make an automatic item sorting system. Make a banner, with a design. Use a name tag to name a pet. Lure and capture a baby Slime (use a name tag to prevent despawning). Breed a horse with max stats (may take some guess work). Find one of every structure. Make a mod grinder from a Monster Spawner of any kind. Explore an Abandoned Mineshaft, defeat a Cave Spider Spawner. Defend a Village from a horde, build a barrier and prevent Zombies from spawning inside. Expand a village to spawn in an Iron Golum. Collect all the fish, make a fish tank. Get at least one disk from a Creeper. Kill a Spider Jockey and a Chicken Jockey. Get a skull of a Skeleton, Spider and Creeper. Create a Wither (wouldn't do this unless your okay with the map being destroyed). Concur an Ocean Monument (extremely difficult challenge). I have some tips on a few things, first is making a branch mine, which I think I will make make in to multiple posts. 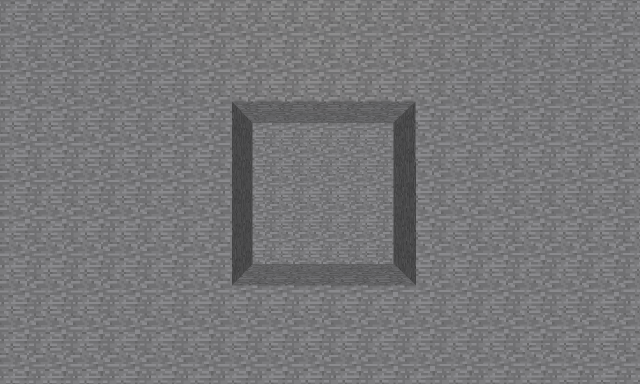 I made an example in Minecraft itself. For me, this what I would consider the most efficient branch mine, carving out the least amount of rock, which would be faster and use less durability on your tools and expose the most surface area. This is going to be a dissected birds eye view, you wouldn't normally see, cause it would be buried inside of rock. Here's what the tunnels would look like. It looks kind of like a pinwheel. This is a view from high above. 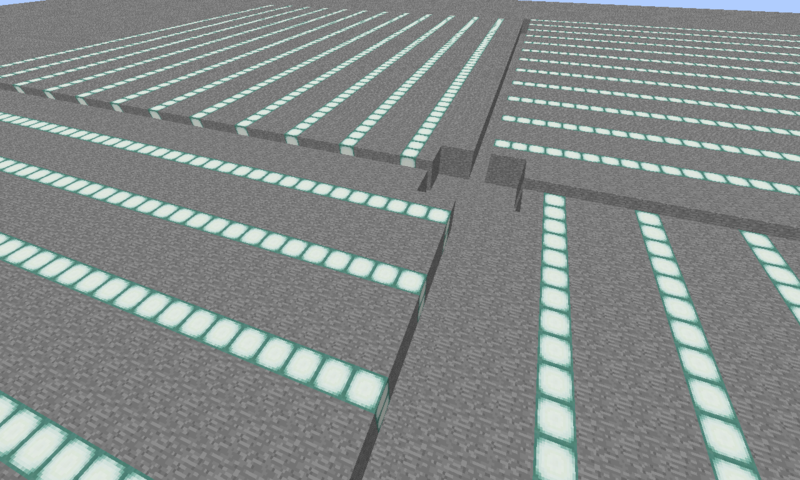 Each tiny light block represents a block you would mine out. I feel this method, you will likely not miss any ore veins inside your branch mine. If the vein is only a single block, you might only miss a few, but chances are you will see it. The chances improve to find every ore if you dig out every vein you see and if you dig out pockets of dirt and gravel. You don't know what you'll find, sometimes it opens up a whole new cave system, of you can find valuable ore you'd normally miss. First you dig a center to the branch mine. This would be the hub. I recommend a 5x5 area and 2 blocks tall, that would be make it high enough to walk through and the low ceiling serves another purpose later. And this would make sort of a room and you can use the space to store chests. 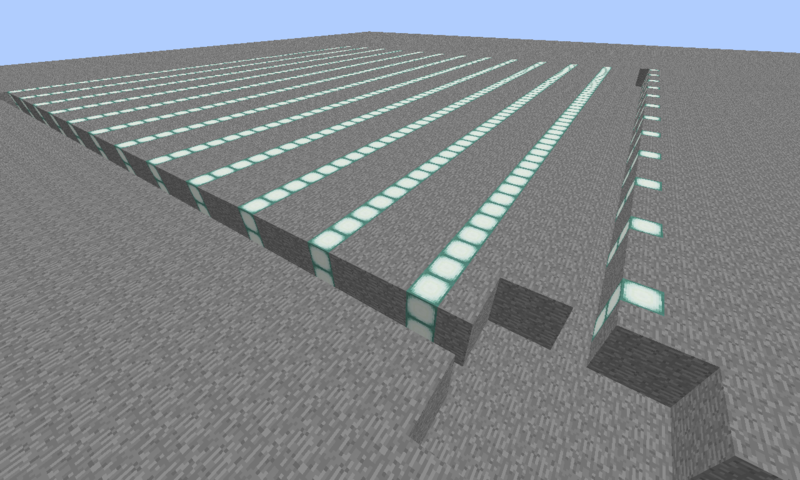 Next, in one direction from the center, dig out the middle of the wall to make a 1x2 tunnel out about 50 blocks. Feel free to dig out any ores you find along the way. Do the same in all directions. These are the parent tunnels, next start the daughter tunnels, which I'll go in the next post. I think there's a limit to uploading size in a certain period, so I'll have to post later. Next, on the right side of each parent tunnel, dig shallow 1x2 tunnels, or notches to mark where the daughter tunnels will start. Space the notches 3 blocks apart. 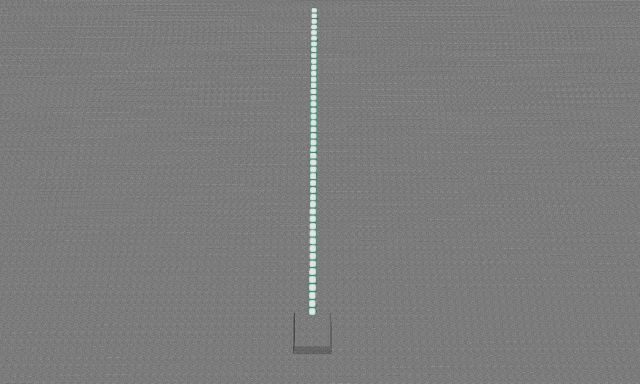 Place a torch inside each notch. 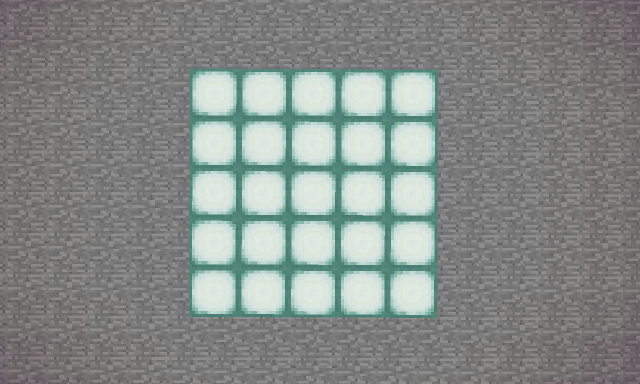 This will keep the mine lit up well and keep mobs from spawning, as long as you keep placing torches in dark areas. You can make the branch mine as big, or as small as you want. 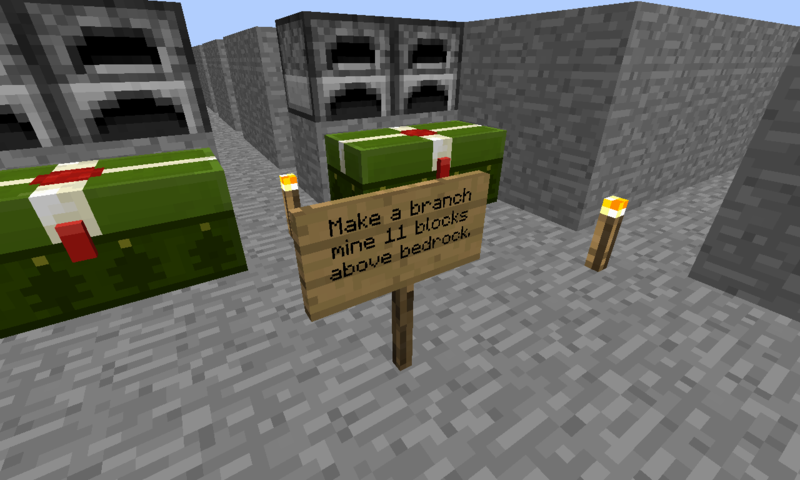 I tend to like to make my branch mine 100 blocks wide. In this case, when you dig out the notches, you should be able to count 12 of them and that should be just the right size. There's a reason for this later. Do the same to the other parent tunnels. Make sure down each tunnel, the notches you dig out are on your right side and there are 12 shallow notches down each parent tunnel. Next, before I start tunneling out all the daughter tunnels, I like to dig out the outer perimeter of the branch mine. You can see what the outer perimeter of the branch mine looks like in the second image I posted in the first part; literally a square around the whole mine. That is what the 12th notch is for, it would mark where the tunnel for the perimeter would be. To find the corner, you can dig to the left, or right at the end of a parent tunnel about 50 blocks, or more then stop and go back to the center of the mine. Go down an end of another parent tunnel, 90 degrees to the last one you came out of and dig towards the direction of new tunnel you made and eventually the corner will meet. Repeat that that step to get the other three corners. Doing this first, you can tunnel out all the daughter tunnels and you know exactly where to stop, cause you'll run in to the outer perimeter. Of course, place torches as you start tunneling. When you exhaust a daughter tunnel of all ores, you can block off both ends with a single block and that will help you keep track of ones that you've already been through. This would be the path to dig for the daughter tunnels. Do the same for the other sides. When you cleared an entire branch mine, you can made another on top of the mine you just finished. Making multiple levels. This is a cut out side view, showing the multiple levels. The light colored blocks mark the daughter tunnels from the parent tunnels. Notice they are staggered on different floors. When you make a new level, you repeat the same steps as with the lower level, but with the daughter tunnels, you dig out notches two blocks ahead. 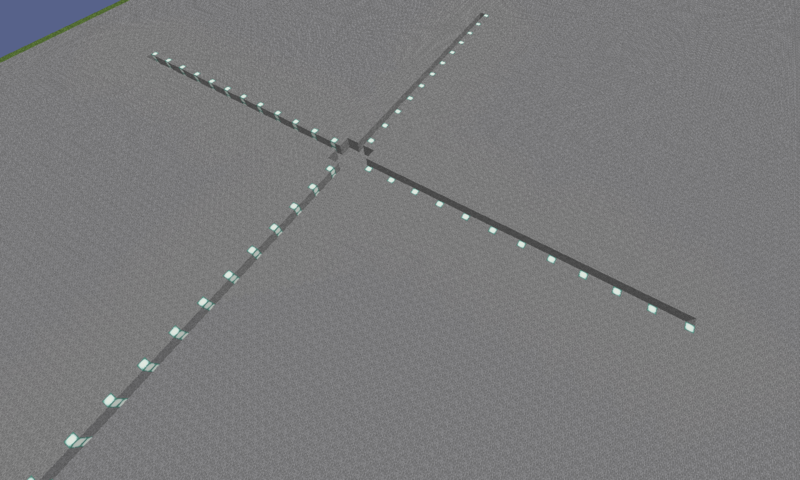 This way, this maximizes the surface area and efficiency of the entire branch mine. As you add more levels, as you see on the third level, you copy the same pattern as the bottom floor and alternate between the two. If you decide to start at bedrock, you can make up to 4 levels using this method and at the 4th level, you'll still be at diamond level. So the amount of ore you can extract, let alone other blocks is enormous. This all looks overwhelming, but it is some thing that once you've done it once, it takes almost no thought to start a new branch mine at any time and goes by rather quickly. Especially with good tools with enchants, makes it a lot faster. Dude doesn't read this stuff, not even a response in years. Hey, Phil. I made you an updated list of things to do for Minecraft. I'll post a copy in your Twitter. Lots of stuff here hopefully should give you ideas for a while. I'm gonna be moving suggestions to a new site, so I'm not flooding this one. It's pretty endless and I'm gonna touch on each subject at some point. Not just in understanding the basic mechanics, but how to play different game modes, what you can do in each, to mastering techniques in each. Then there is whole different realms to Minecraft, because learning to play the game well just scratches the surface. There is nearly countless types of ways you can play and interact in the game. Each platform has different editions of Minecraft and some have access to special features you can't get on others. There's over a dozen different editions and with some you can have access to newer and older release versions and experimental versions. An unlimited source of community servers, to find some inspiration. The ability to implement computer networking on your own worlds, modding, coding, testing, customization in vanilla, or with different clients and world generation in vanilla, or tool assisted. Another topic I'd want to cover is building a name to a play style, experimenting alone or seeing out a network with other experienced Minecraft players, on improving content and viewer interaction. Approached certain ways, Minecraft can be a decent source of income.